The end has finally arrived. After 40 years of corruption, Mexico’s infamous “garitas” are being dismantled, thanks to new national legislation. The garitas are secondary checkpoints, where customs officers can inspect vehicles outside an established 20-kilometer border strip, a privileged zone where taxation is lowered in order to promote and boost local economies. Most notable of the garitas being abolished is the “Caobas” garita of Chetumal, in southeastern Mexico, in the state of Quintana Roo, bordering Belize and Guatemala. Here, thousands of people have been extorted for transporting alleged export merchandise without paying the established import tax fee. Chetumal, as a border city, used to be a hub for the sale and acquisition of contraband until 1994, when the Belizean Free Zone was established. Up until the mid-1990s, the Caobas garita was literally bursting with confiscated goods, including stereos, televisions, clothing and, especially, Orient and Citizen watches, liquor, perfumes and Chinese shoes. However, with the passing of time, the garitas acquired a reputation for being places where citizens were abused for owning certain types of goods. A person might have a Rolex around his wrist that was purchased 20 years before but if he had to cross a garita that was placed almost a hundred miles from the border, he had to produce documents proving its legal purchase, including tax documents, and he risked its confiscation by authorities. The same was true for stereos in vehicles and anything else being transported or worn, including footwear – Converse sneakers and Florsheim shoes in particular. As a result, posting to garitas became one of the most coveted government positions. The power to inspect the tens of thousands of vehicles that crossed garitas on a monthly basis became overwhelming. For travelers, regardless of where they were coming from or going to, being ordered to return or report to the closest border checkpoint to legitimize possession of goods, regardless of when or where these were acquired, was comparable to a dreadful Kafkian nightmare – particularly if the checkpoints were located a hundred miles away. 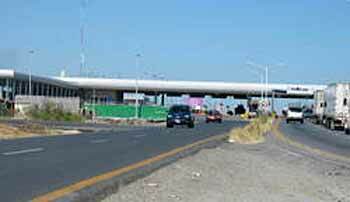 Along Mexico’s northern border, the most infamous checkpoints were the Puerto de Janos and Samalayuca garitas in the state of Chihuahua, and the one known as Veintiséis, or Twenty-six, for its location at kilometer 26 along Federal Highway 85 in the state of Tamaulipas, just south of Nuevo Laredo. From a purely legal perspective, the garitas were unconstitutional. The Mexican presidency was entitled to habilitate and designate the location of border customs checkpoints within the privileged 20 km strip. However, the majority of these were located outside this area. In addition to this, they were discriminatory due to the fact that anybody in transit outside these supposed privileged areas was not subject to customs inspections. But all of this is history now thanks to a new fiscal reform adopted by the Mexican Congress. As of now, the 11 percent taxation zones along the 20 kilometer border strips have disappeared, the entire country is subject to a new 16 per cent tax fee and the garitas are to disappear completely by 2015.